In mid-December, the Van Duzer Corridor AVA committee announced the TTB’s approval of the Van Duzer Corridor AVA (American Viticultural Area). The appellation marks the 19th AVA in Oregon and remains part of the larger Willamette Valley AVA. It is located 20 miles northwest of Salem covering 60,000 acres. The Van Duzer Corridor represents an anomaly in the Coast Range, channeling mild oceanic air into the Willamette Valley, creating the ideal paradigm of warm days and cold nights. 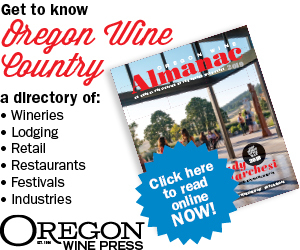 This pattern allows the production of world-class wines in the Willamette Valley, specifically within the 35.9-square-mile triangle constituting the new AVA. From the Pacific winds that funnel through the area, this AVA receives a cooling effect as early as two o’clock in the afternoon. Breezes dry out the vine canopy and decrease fungus pressure, making sites highly attractive for sustainable grapegrowing, reducing the need for extra fungus spray. As a phenomenon of wind protection, the grape skins thicken, leading to an abundance of anthocyanins (color) and tannins. The buffering effect is highly noticeable and varies from one vintage to another. While nearby regions of the Willamette Valley face overly warm conditions, this area is usually slightly cooler. The opposite is also true: When nearby zones of the Willamette Valley face below-average temperatures during the growing season, this AVA receives generous mild air from the ocean, tempering the area. These combined effects allow for near-perfect growing conditions with high consistency for wine quality while mitigating the potential harmful effect of late and cold vintage. The AVA’s soil consists of marine sediment with some basalt over siltstone bedrock. While these ancient seabed soils — aged 50 million years, roughly — remain unique to the area and impact both grapes and wine, the fortunes of this AVA rest with the wind. Within the triangle that composes the Van Duzer Corridor, nearly 1,000 acres are occupied by 18 commercial vineyards planted to everything from Pinot Noir to Zweigelt. The number of vineyards will increase as Bjørnson Vineyard and California winemaker Ehren Jordan complete new projects. Nine licensed wine producers currently crafting wines within the AVA boundaries include Johan Vineyards, Chateau Bianca, Holmes Gap Vineyard, Havlin Vineyard, Namasté Vineyards, Firesteed Cellars, Andanté Vineyard, Left Coast Cellars and Van Duzer Vineyards.